In business, feedback management has a reputation for being soft – and for good reason! Leadership teams do not apply the blow torch to their market-facing interventions often enough, to understand the real business outcomes. It’s easy to understand what outcomes are possible from listening and responding, and how that translates to the bottom line. That’s because there are only 4 financial outcomes to look for from any program that listens to your key stakeholders- customer, employees or partners. The disarmingly simple model you could use to align the thinking of your team is what we call ‘4 ways to profit’. Water passes under the bridge quickly, so the financial results from any listening program must be flushed out in a timely fashion, documented and used to encourage better practice. This simple 3 step process works well in conjunction with the 4-ways to profit model. Step 1: Benchmark what your people think– Before feedback is gathered, a benchmark should be taken to see what the internal view of the business health of the customer base is. This gives a good read on the current business situation before the input of feedback and before any action is taken. For example, under retention it’s valuable to know which specific relationships are considered vulnerable, not vulnerable or to identify where the team doesn’t know. Revenue or profit should be put against each customer and calculated for each of the four business outcomes. 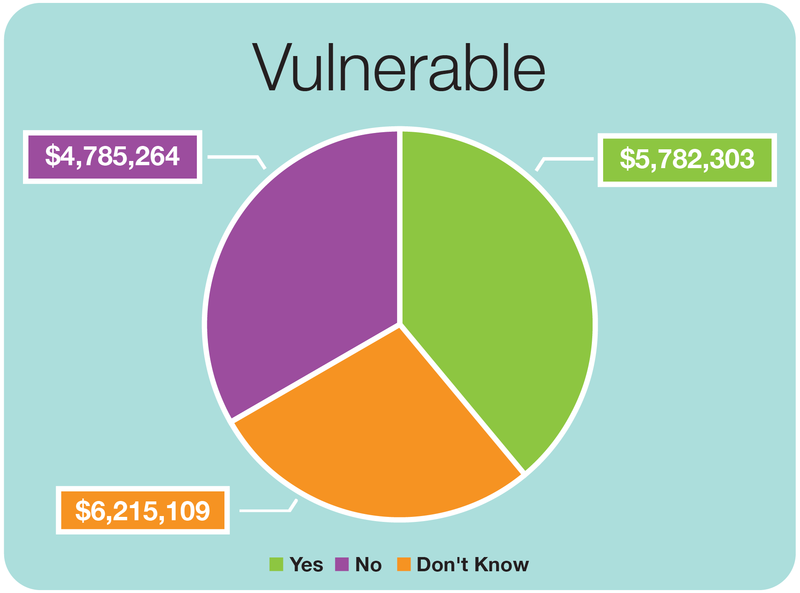 In this example, the chart shows the number of customers who fit into each of the 3 vulnerability groups: vulnerable, not vulnerable or don’t know – and the dollar value attributed to each of the groups. The disturbing discovery here is that about 70% of this customer base is either considered vulnerable by the people who deal with them, or they are not sure. Step 2: Run the listening program– From this you will understand the sentiment of each individual customer you have already benchmarked in step 1. Actions can be taken to address issues raised in the feedback given. Step 3: Post- pulse evaluation of the financial results– After the feedback is gathered and actions are taken to follow up, the initial benchmark evaluations for each individual customer should then be re-visited (e.g. are they still vulnerable or not?). By what dollar value have vulnerable customers (or don’t knows) reduced? What is the dollar value of saving surprisingly vulnerable customers? Functionality in the MirrorWave Control Panel makes it easy to manage each of these steps, by providing an easy interface for entering benchmark information on each individual customer. Automatic reporting then looks at the feedback of each customer against each of the 4 financial outcome types. A second interface records any successes your people have with customers as they close the loop on their feedback. A dollar amount can be placed against any of these successes. This ensures the leadership team can see and add up the many small, but hard-to-see gains that are achieved in the field, but quickly get forgotten or never even reported. Further to the 3-step process, here are some examples of practical actions that can be taken for each of the 4 business outcomes. This approach is invaluable for driving profit in your business. You can quantify the difference the actions you’ve taken have made – and how this affects your bottom line. Making this a regular and embedded process in your business ensures your whole team’s focus is aligned, and you will shine an ongoing light on building the bottom line.